Using the "Client reporting" tab in the Clients menu, you can see your overall adherence with your exercise programs. Physitrack allows you to track your client's pain and adherence with their exercise program. 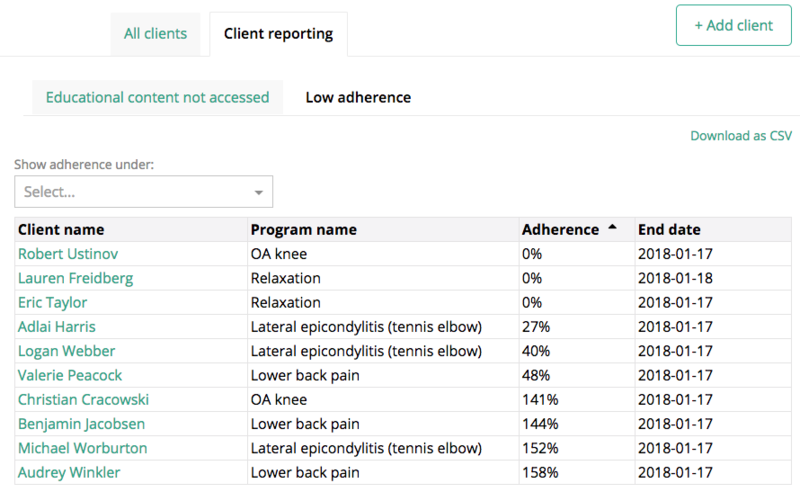 While this is viewable individually in the client's file, using the "Client reporting" tab in allows you to look at program adherence in your patient cohort as a whole. Go to Clients and select the "Client reporting" tab. View overall cohort adherence as a percentage in the "Low adherence" tab. View who has accessed their educational content via the "Educational content not accessed" tab. All content is downloadable via the "Download as CSV" button on the right side of the page.